San Francisco Community Health Center is firmly in support of proposition C that is on the ballot this November. We know that housing solves homelessness. 50% of Prop C’s funding will pay for construction, rehab, prevention and operating subsidies of approximately 4,000 units of housing over the next eight years and mandates that families and youth are given priority. Our goal is to house all who are currently experiencing long term or chronic homelessness, are sick, are youth, and families with children. This funding is for intensive wrap-around services, street-based care, treatment, drop-in services, residential facilities, and housing for people suffering from mental illnesses and substance use disorder. Given the high cost of living, many people in San Francisco are housing insecure. In fact, we know that 70% of those currently experiencing homelessness were originally housed in the city. Those who live in fear of losing their rent-controlled unit – who are one medical emergency, fire, or other personal disaster away from homelessness, deserve our support and protection. This would ensure 7,000 households get legal assistance, permanent or temporary subsidies to stay in their housing, or other forms of help they need to stay housed, such as help with electrical or other bills. 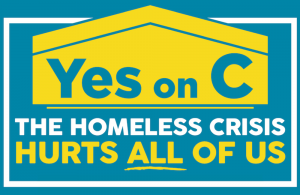 Prop C will pay for 1,075 new shelter and navigation center beds, as well as fund drop-in hygiene programs. Let’s keep our streets clean by having dignified bathrooms and showers for everyone. 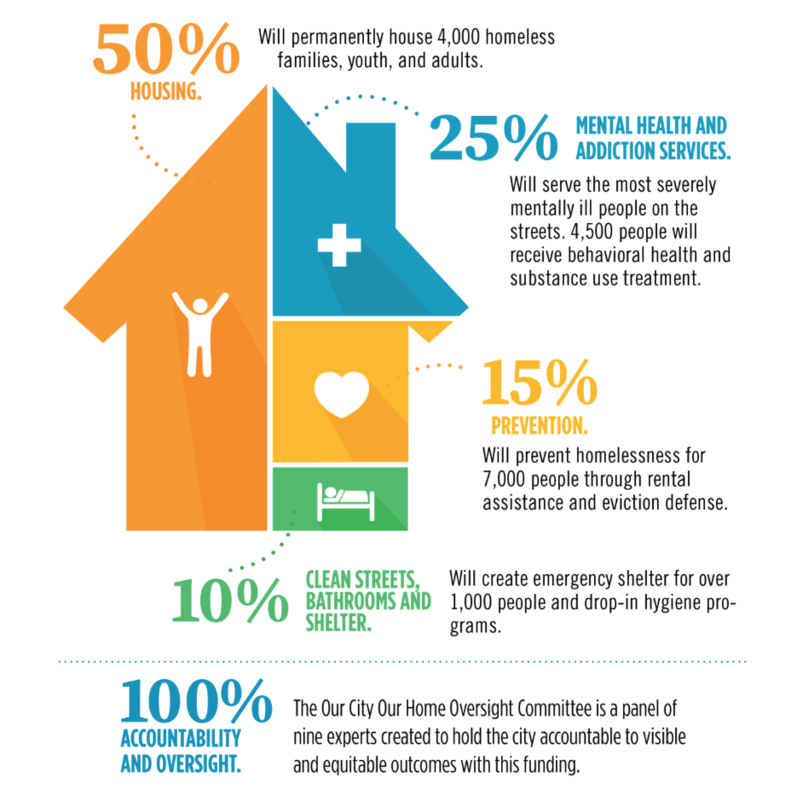 This initiative requires an Oversight Committee comprised of nine experts on homelessness, supportive housing, mental illness, substance use disorder, and development, who will recommend funding priorities, promote transparency and cultural competence, and produce regular reports about who has been served by this fund and what still needs to be done for the Board of Supervisors. The funding must be spent on intended use. The funding will be overseen by department contracting managers who scour every dime spent, and closely examine budgets. The housing component of Prop C is based on the Department of Homelessness and Supportive Housing’s strategic framework. The Department has done a lot of work in identifying sites, looking at data driven outcomes, and modeling successful interventions. One difference in this initiative from the framework is that we also serve youth and families with children, two populations that have been invisible and largely neglected by city efforts. Data show that half of all homeless people in San Francisco became homeless before the age of 25, and we want to go upstream and ensure young people get stabilized quickly before permanent damage is done. Therefore, portions of the housing funding are set aside for families with children and youth.